Harvey Milk was a gay-rights activist in the days before it was before it was fashionable or safe to be one. This makes him a very different animal from the modern PC-policing, cultural-Marxist variety. Today's gay-rights activist cries oppression at every hint of personal bias against non-hetero/cisgender sexuality and seems to be as much bully as victim. Milk's modern-day counterparts rightfully hold him up as a true civil-rights hero. Like all Marxists, however, they ignore those facets of history which inconveniently contradict their ideology. For the heroic Harvey Milk was not one of them. Little is written of Milk's days before his rise to prominence in San Francisco politics, in part because he worked in support of Barry Goldwater. That's not a misprint. The "L-word" that we could apply to Milk based on his public history is "Libertarian". 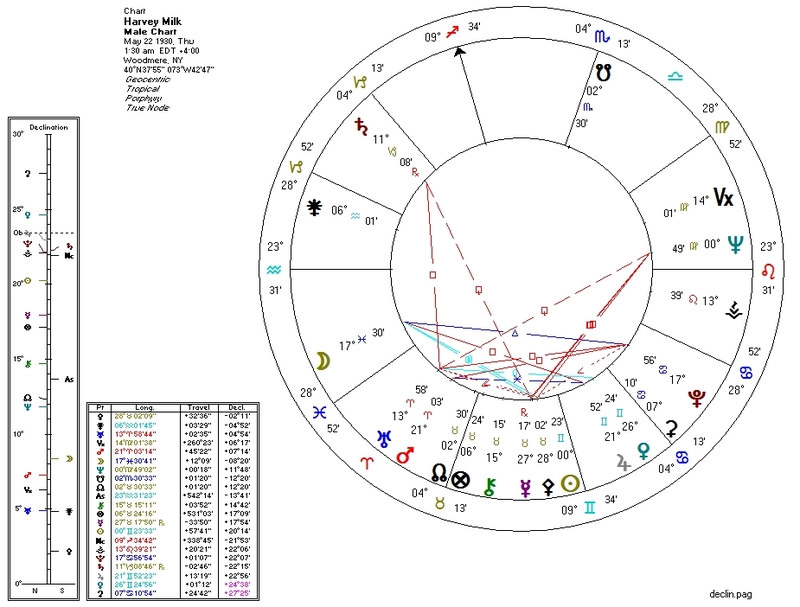 Yes, Libertarian: Milk's chart has the Sun conjunct Pallas (as per Ron Paul, Lew Rockwell, and G Edward Griffin) and Mercury conjunct Pallas (as per Lysander Spooner, Tom Woods, and MLK). These are the two single most powerful libertarian aspects you can have on a chart, and we have them here on the same chart. There are mitigating factors (a quincunx from the South Node and a semisquare from Pluto) but these are no match for the two Pallas conjunctions. It's not even close. No doubt other astrologers have already pointed out the Mars-Uranus conjunction (unconventional sexuality, for his era) and Venus-Jupiter conjunction (numerous and/or public love affairs). Pallas, however, is what defined his life and his struggle for human freedom regardless of sexual proclivities.